Each Whitlow Jawharp is hand-crafted from the finest materials and hand-tuned to standard pitch. The Whitlow Jawharp is guaranteed to the original owner for life. PLEASE NOTE: Orders outside the continental United States require additional shipping. Pick the jawharp up and hold it as shown in Figure 2 using your non-dominant hand (not the one you write with). Hold the frame firmly without touching the twanger. Bring the jawharp up to your mouth with the tip of the twanger pointing away from you. Open your teeth about 1/4 inch and place the front edge of your teeth on the two straight parts of the frame. Press the jawharp in firmly against your teeth. YOUR TEETH MUST REMAIN OPEN! Rest your lips on the straight parts of the frame. Now carefully move the twanger in and out of your mouth to see if anything is in its path. If the path is clear gently stroke the tip of the twanger using a straight ahead, horizontal motion. This should produce a pleasant twanging sound. 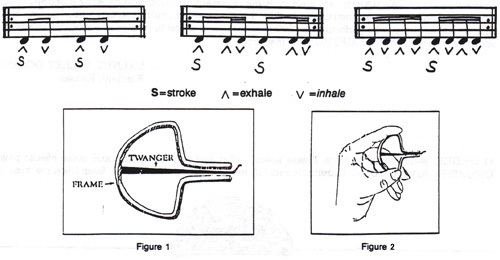 To make your jawharp sound louder, breathe in or out as you stroke the twanger. ALWAYS STROKE THE TWANGER GENTLY! Volume comes from how hard you breathe and from playing a high quality instrument. Playing too hard will make your jawharp rattle and may result in injury to you or your instrument. To play melody, you will have to learn to play different tones, high and low. To play different tones, sing silently using the vowel sound ah, while breathing continuously (in/out). For low tones, say ō; for high tones, say ē. Practice saying your long vowel sounds silently through the jawharp, while breathing continuously (in/out). "IT DON'T MEAN A THANG IF IT AIN'T GOT THAT TWANG"
The WALNUT VALLEY FESTIVAL is pleased to welcome WHITLOW JAWHARPS to this year's event. 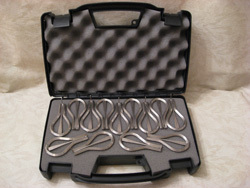 The WHITLOW JAWHARP was selected as the world's finest jawharp at The International Jew's Harp Congress in Iowa City, Iowa based on sound quality, playability and appearance. 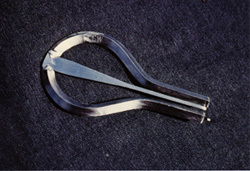 WHITLOW JAWHARPS are the instrument of choice among many of the world's top players including John McCutcheon, Mike Seeger, David Holt and Grandpa Jones. WHITLOW JAWHARPS are hand-crafted from the finest materials following the method invented by Fred Whitlow. In addition, each WHITLOW JAWHARP is carefully tuned to standard pitch, enabling it to be played with other in-tune instruments. WHITLOW JAWHARPS are available in all keys and come with a no-gimmick lifetime guarantee. Today's WHITLOW JAWHARPS are built by Robbie Clement for TOMORROW RIVER MUSIC of Madison, Wisconsin. Besides being an instrument builder, Robbie is also a multi-instrumentalist (guitar, banjo, dulcimer and jawharp) who performs over 300 workshops and concerts each year. Robbie is the author of the soon-to-be-famous JAWSUKI METHOD for jawharp. Copyright 2008 Robbie Clement. All Rights Reserved.